About a month ago or so, I found myself at Barnes & Nobel Bookstore in Plano, a pretty likely place to find me actually, and I was looking for a book to help me with my weight. I readily admit that keeping a fit figure has been really hard for me, especially since I went through my gender transition and have a new hormonal balance. Or maybe it is just my wishful thinking to blame it on hormones. Either way, weight issues are hormone issues and I know I eat to keep my blood sugar levels steady. Even when my tummy is full, I eat for the blood sugar. And though I shoot for whole foods, sometimes it is more like a whole-lotta foods. I eat more calories than my body needs, so I’m trying to learn to do better, and I may go to a nutritionist for some help beyond what my doctor can do. Okay, so, Barnes and Noble. 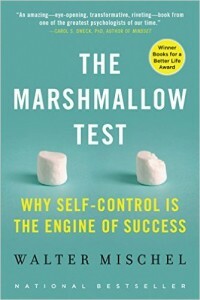 I found a book I fell in love with called The Marshmallow Test by the famous psychologist Walter Mischel. I’d never heard of him, but he’s rated in the tops of the tops. Well, I can see why. He has a great book plum full of tips on how to gain self-control. 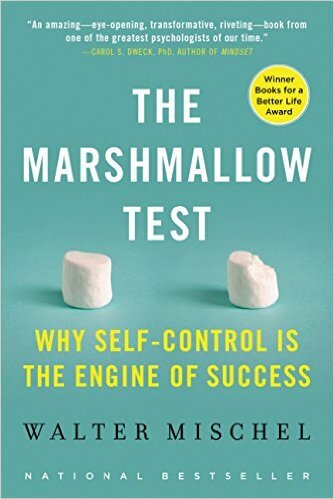 The Marshmallow Test is about experimenting with children to see how they handle their own ability to resist eating marshmallows. In a nutshell, they are presented with a tray of two marshmallows and told, “You can have one now, OR if you wait 20 minutes, you can have both of them.” The experimenters go to work. They children a variety of coping skills to see what happens. Some are downright naughty, like encouraging the kids how good the marshmallow will taste. Others like imagining you only are seeing a “picture” of the marshmallows and they are not real, are fascinating. The bottom line is we have to figure out how to overcome and deal with our “hot” brain that drives us for immediate gratifications, by using our “cool” brain which is a lot more sensible. In fact, we may need to imagine a bad outcome to come up with an alternative hot brain scenario. Read the book and I hope it will help you. I’m putting it to use. I was inspired to write some affirmations based upon the book. I may update this post to come, with updated affirmations, but this is what I have for now. Affirm control, in whatever area you struggle with! This moment, I step back from myself. I look squarely at the road I want to travel. I am the decider. I am the master of myself, my life and my destiny. I strengthen my self-control. I build mental muscles. I am the driver, not the driven. I take ownership of my mind. I practice bit by bit, turn by turn, until I can steer. I sharpen my willpower, my drive – I trust that I can. I am not the victim of my past. I am the captain of my future. I look away from temptation. I look past it. I look ahead. I imagine the benefits of long-term healthy choices. I steer around the black holes of temptation. I find a lighthouse to bring me home to goodness. I embody stillness. I keep my stress low. I find the calm in my breath. I choose peace. I remember to feel my body, from my tiny toe to the top of my head. I embrace the outdoors. I imagine this moment to be exactly what it needs to be. I release struggle away from this moment. I choose to quiet my mind. I recognize all that pulls me away from peace is my ego. I do not hold grudges. I forgive myself and others. I hold all in positive regard, including myself. I develop a good personal relationship with my own self. I set good boundaries with others. I do not control others. Others don’t control me. I may not like setting boundaries, but I do it anyway. I develop a sense of psychological self-distance. I exert my own cognitive control over my thoughts and feelings. I have strong executive control in my brain. I learn to understand my own mind and examine my beliefs. I analyze my feelings and actions and the reasons behind them. I am confident; I believe in myself and take on a positive outlook. I take a can-do attitude about my abilities and I expect success. I let go of any sensitivity to rejection and criticism. I take a deep breath and regulate my thoughts with an “If___, then____” plan when it happens. I delay my actions and think. I create a psychological immune system to reduce my stress and protect me from depression and risky behavior. I am a good person, I am smart and I am worthy. I evaluate myself in a positive way. I have self-control and I am the captain of my future. This entry was posted in Affirmations, BLOG Entries. Bookmark the permalink.